Irrespective of one’s religious beliefs, Christmas is a special time to millions of people around the world. Each person, each family have their own manner and traditions when it comes to celebrating the day. I’ve come across some fascinating and unusual ways as to how people celebrate Christmas around the globe; but none as unusual as how Ian Thorpe, one of the founders of The Africa Trust, will be spending his Christmas this year. Ian will be with the Maasai people of Tanzania on the slopes of Kilimanjaro Mountain where AquAid has funded a water pipeline. Before the pipeline was installed, children had to walk up to 5 miles each day for clean water, preventing them from attending school and having hope of a better life. 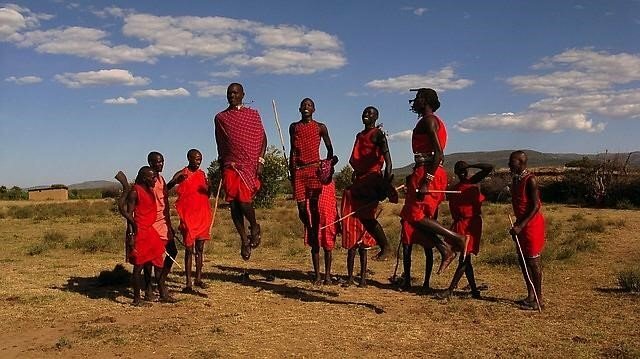 The Maasai are an ethnic group of semi-nomadic people inhabiting southern Kenya and northern Tanzania. They are among the best known local populations due to their residence near the many game parks of the African Great Lakes and their distinctive customs and dress. Some of the Maasai are Christian and their warriors generally congregate under trees near the local open air market on Christmas Day. They kill goats and roast the meat on sticks over an open fire. No salt is used as they say it spoils the flavour of the meat. Only meat is eaten, but in very large quantities. Four Maasai warriors can consume a whole goat in a few hours. When walking with the Maasai, Ian is sometimes offered blood to drink/eat which they harvest from the cows they herd (the Maasai people drink blood and milk and blood from cattle for protein and caloric needs. Blood is very rich in protein and is good for the immune system). Ian said he didn’t mind this too much, but it can be off-putting when a warrior urinates into the calabash of blood before passing it to you. The urine helps to preserve the blood and slows down clotting. 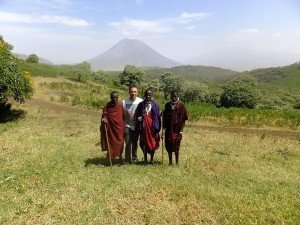 Aside from being with the Maasai this Christmas, Ian usually spends his days in Africa helping with the day-to-day running of The Africa Trust as well as travelling to different villages, towns and countries to see how The Africa Trust can help. 40p from every bottle of water sold, and £20 a year from every plumbed in water-cooler installed is donated to Africa Trust. This means that with each water purchase, a donation is made that allows for them to continue with life-saving, sustainable water projects throughout Africa.